In the last video / article How to Layout a Website, I showed you how to set up the header, import Google Web Fonts and the basics of CSS. In the tutorial, I’ll show you how to make pretty complicated layouts. I show you how to overlay divs and how to make adjustments with CSS until everything looks perfect. If you need to brush up on HTML or CSS here are video tutorials on those subjects. Like always the code follows the video. Use it however you’d like. 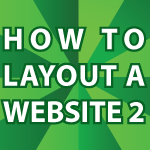 If you missed part 1 of this tutorial, definitely watch it first here How to Layout a Website. How about a tutorial on designing sites using Liquid Layout Techniques? I am so impressed with your tutorials and I wonder how do you organize your day….how did you write some many article, made videos and as I see you also have a baby too. I am really motivated and feel, wish I could do at least 50% of what you have done in 1.5 years. Are of Marissa Mayer type who sleeps for just 4 hours and get going ? If there is really a secret on making the day so much productive can you please upload a video of the same….thx a lot again. Thank you 🙂 I figured out early on that I processed information differently from most people. I’d sit in class for an entire day and not remember anything. Because I grew up rather poor, we didn’t have a television and I read for entertainment. By accident I taught myself how to speed read. Because I’d get bored, I would quickly scan through pages with my finger as I read. This is the basis behind how people speed read. I talk more about it here along with other ways I learned to study Study Methods. Another reason why I produce so much information, is because my personality is inclined to complete projects. That is why my early articles often have typos. I set a goal of writing an article or making a video every day. I literally beat myself up if I skipped more than 2 days without creating something. As you may have seen, my early articles were also very long. So, by not forcing myself to be perfect (grammar wise) I was able to generate a great deal of information. I would often speed read a book and then sit down and write an article based on what seemed most important. I’m almost positive I have attention deficit disorder, but because I was never treated with drugs I instead figured out how to live with it. I sleep, but like you said I rarely sleep more than 5 hours. I’m also very intense in person. I’ve never met anyone in the real world that first met me through my blog, but I’d guess they wouldn’t expect me to act the way I do. Hi, very inspiring. Excellent website. Really enjoying following your lessons. Thanks for your shared wisdom! Just want to say ,Thanks and keep going. I am a very big fan of you, and it’s amazing how you do all those tutorials and explain everything so clear, oh and your tone of voice is so good to my ears and makes me even more concentrated while learning from your tutorials. I am an IT student from the Solomon Islands but currently in chile, and I am currently working a website and with help from your tutorials I can manage to learn so many things for my project. I would like to say thank you so much. Hi Phil, Thank you very much for the kind message 🙂 I greatly appreciate it! It is very gratifying to hear that I’m helping people all over the world. I plan on making videos for a very long time. I’m glad they are helping you. May God bless you and your loved ones as well. I want to Thank you for all that you do to enlighten the human race. I will also I to Thank your wife for allowing us to share the family’s time. My God bless you and yours. What a BIG heart you have. I see that you have FOUND your purpose in life. It’s great to see someone living out their purpose. So, here’s my question to you…I would like to put together a 4 to 6 page E-commerce website, with a blog post without using 3rd party software. I was wondering which set of tutorials of yours will help me along. And, if for some reason(s) I can’t finish by June ’14, what are your rates? By the way you can send your rates to my email address. Again, Thank you for everything…. Thank you for the very kind compliments and may God bless you and your loved ones. I made a tutorial on how to set up a secure shopping cart using free software here. This is what I use and there is pretty much no chance of anything being insecure because PayPal handles everything. To make something in which you except credit card numbers directly is very complex. Every time you hear about a security flaw, chances are that people who tried to use their own software shopping cart just lost a bunch of credit cards. There are always security holes. That is why I use PayPal, because if something goes wrong they are to blame. I plan on making a tutorial on the Zend framework some time soon. I have used it every time I needed to handle secure data. Thank you very much for the offer of work, but I just made this site to help people. I don’t solicit for business here. I’m very lucky to have more work then I can handle. Thanks for your reply and I will look into the free software you mention. Again Thank you for this great site Derek. I’m happy i can help 🙂 You’re very welcome.